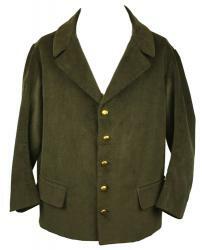 Watch this page for super deals on OVERSTOCK and Closeout clothing and items as well as Used, Vintage and Antique clothing. This is your chance to get quality merchandise at a significantly reduced price. 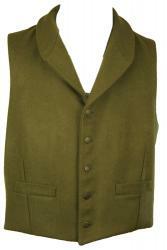 These items are usually one-of-a-kind and are offered on a first come, first served basis. 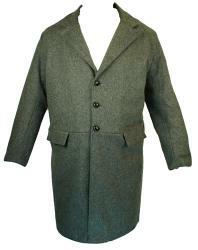 All items from this page are "as is" and all sales are final. All used clothing listed here has been cleaned (either WASHED OR DRY CLEANED) and repaired as needed, but will not include any resizing or alterations. No used clothing will be sold DIRTY OR SOILED. 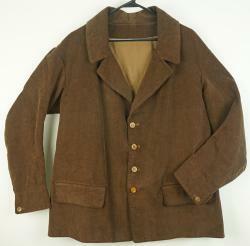 Vintage and Antique clothing are an exception. You may want to call to see if the item is still in stock before you place your order. Be sure to have your measurements available when ordering. We want to ship you the right size the FIRST time. 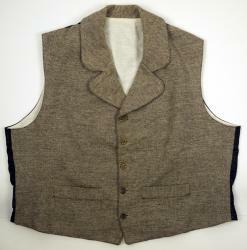 LIKE NEW CONDITION - SIZE 38 Quartermaster Shop CS Officer 14-Button Double Breasted Frock Coat made of Cadet Grey Wool with BUFF branch of service PIPING trim on the collar and cuff. 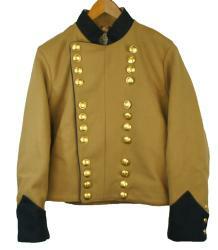 3 rows of gold sleeve braid and 3 stars with infantry background on each side of the collar. CS Staff buttons. Very gently used. Only 1 available. Sold AS-IS and all sales are FINAL. 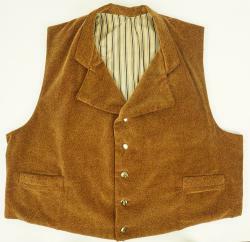 This coat comes complete with a 14 button front with CS Staff buttons, fully lined with brown cotton lining for the coat body, sleeves linings are natural cotton, and 1 inside pocket. 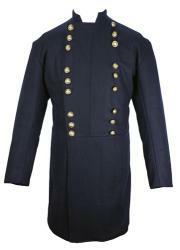 There is a 6 button officers pattern on the back of the the coat. 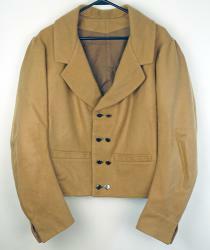 The back folds of the skirt conceal additional pockets. The cuff is a 3 button functional cuff. 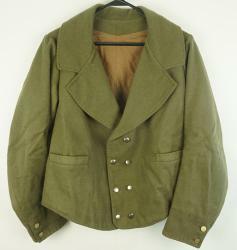 NEW, NEVER WORN SIZE 40 C&C Sutlery Artillery CS Shell Jacket in MEDIUM GREY wool has artillery red PIPING trim on collar and cuff, 7-button front, a plain back and CSA buttons. 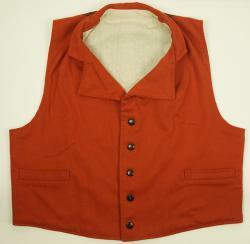 It is lined and has one inside pocket. Only 1 Available. SOLD AS IS. All sales FINAL. This Leather Cartridge Box Sling is made of high quality American leather. It is approximately 72" in length. Available in BLACK leather. 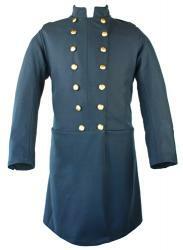 This M1858 Smooth Side Canteen with Navy Blue Wool Cover is made of Stainless Steel but has a "tin-like" look. The cover is Hand-Stitched on the canteen. The canteen is 7.5 inches in diameter. Complete with cork & chain and linen sling. Note: C&C Sutlery no longer sells tin canteens because the quality of the imported tin received was poor. This stainless steel canteen has a "tin-like" look but doesn't rust like tin. 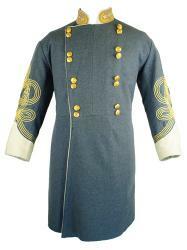 This M1858 Smooth Side Canteen with Sky Blue Wool Cover is made of Stainless Steel but has a "tin-like" look. The cover is Hand-Stitched on the canteen. The canteen is 7.5 inches in diameter. 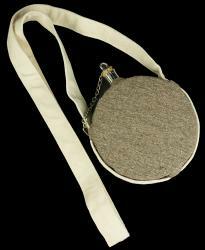 Complete with cork & chain and linen sling. 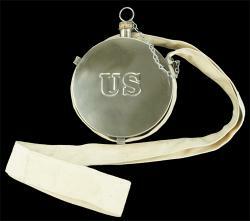 This M1858 Smooth Side Canteen with Grey Wool Cover is made of Stainless Steel but has a "tin-like" look. The cover is Hand-Stitched on the canteen. The canteen is 7.5 inches in diameter. 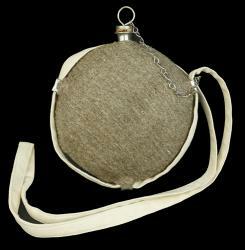 Complete with cork & chain and linen sling. 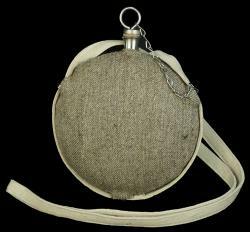 This M1858 Smooth Side Canteen with Jean Wool Cover is made of Stainless Steel but has a "tin-like" look. The cover is Hand-Stitched on the canteen. The canteen is 7.5 inches in diameter. Complete with cork & chain and linen sling. This Bullseye Canteen with Grey Wool Cover is made of Stainless Steel but has a "tin-like" look. The cover is Hand-Stitched on the canteen. The canteen is 7.5 inches in diameter. Complete with cork & chain and linen sling. 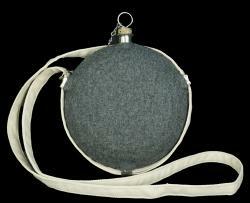 This Bullseye Canteen with Jean Wool Cover is made of Stainless Steel but has a "tin-like" look. The cover is Hand-Stitched on the canteen. The canteen is 7.5 inches in diameter. Complete with cork & chain and linen sling. 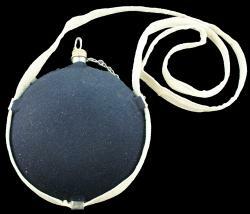 This Bullseye Canteen with Navy Blue Wool Cover is made of Stainless Steel but has a "tin-like" look. The cover is Hand-Stitched on the canteen. The canteen is 7.5 inches in diameter. Complete with cork & chain and linen sling. This Drum Canteen without a Cover is made of Stainless Steel but has a "tin-like" look. The canteen is 6.5 inches in diameter and about 2 inches wide. 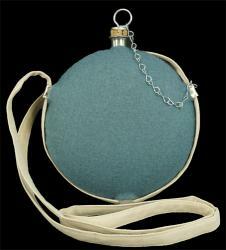 Complete with cork & chain and linen sling. 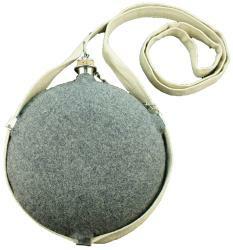 This Drum Canteen with Grey Wool Cover is made of Stainless Steel but has a "tin-like" look. The cover is Hand-Stitched on the canteen. The canteen is 6.5 inches in diameter and about 2 inches wide. 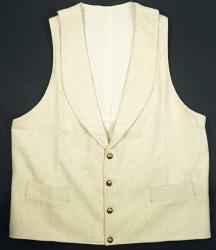 Complete with cork & chain and linen sling. 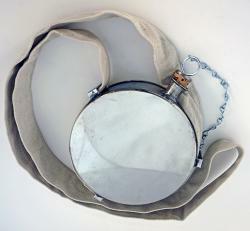 This Drum Canteen with Jean Wool Cover is made of Stainless Steel but has a "tin-like" look. The cover is Hand-Stitched on the canteen. The canteen is 6.5 inches in diameter and about 2 inches wide. Complete with cork & chain and linen sling. 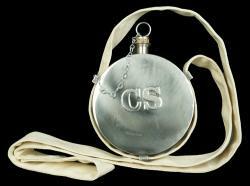 This CS Stamped Drum Canteen is made of Stainless Steel but has a "tin-like" look. The canteen is 6.5 inches in diameter and about 2 inches wide. Complete with cork & chain and linen sling. This US Stamped Drum Canteen is made of Stainless Steel but has a "tin-like" look. The canteen is 6.5 inches in diameter and about 2 inches wide. Complete with cork & chain and linen sling. 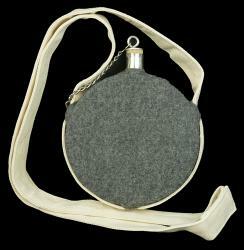 The wool Canteen Cover fits Bullseye and Smooth Side Canteens that measure approximately 7.5 inches in diameter. 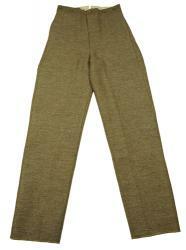 Available in Butternut, Cadet Grey, Medium Grey, Navy Blue, Richmond Grey, Sky Blue, Tuscaloosa Grey, and Jean Wool. 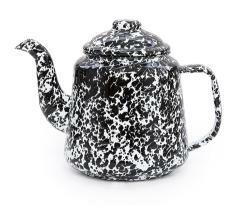 **** CLOSEOUT **** Black and White Marble Splatterware 1.6 quart tea pot. This tea pot is 6.75" high and 5.25" in diameter. It holds 52 ounces. ONLY 1 REMAINING. This item has been discontinued by the manufacturer. 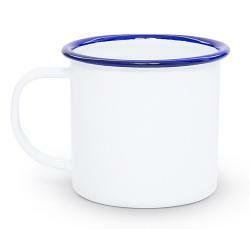 Please read the Use & Care Guidelines to keep your new enamelware in great shape for generations to come. Porcelain-coated steel ensures perfect conductivity and consistent heating properties, ensuring dependable results. Enamelware can safely be used on the stove (electric or gas), in the oven, on a grill or barbecue, and over an open fire. Because enamelware is made of a steel core, it should never be used in a microwave. Enamelware is dishwasher safe. This enamelware passes all FDA and California Prop 65 food service requirements. 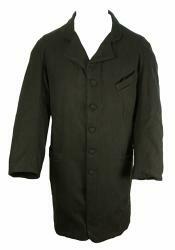 Made with strict adherence to US government standards in the same factory since 1977. Imported. 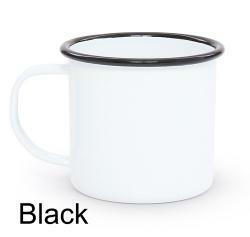 **** CLOSEOUT **** Black and White Marble Splatterware 1.5 quart Pitcher is 5" in diameter and 7.25" high. ONLY 3 REMAINING. 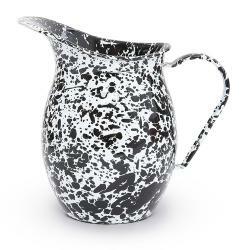 **** CLOSEOUT **** Black and White Marble Splatterware 3 quart Pitcher is 6.5" in diameter and 9" high. ONLY 2 REMAINING. 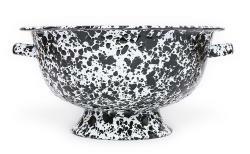 **** CLOSEOUT **** Black and White Marble Splatterware Colander. This 4.25 quart colander is 11" in diameter and 6" deep. ONLY 2 REMAINING. **** CLOSEOUT **** Black and White Mable Splatterware Ladle. This ladle bowl is 3.5" in diameter and 12" long. ONLY 2 REMAINING. **** CLOSEOUT **** Black and White Mable Splatterware Large Serving Spoon is 12" long and the bowl is 2.5" wide. ONLY 7 REMAINING. 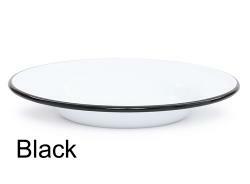 **** CLOSEOUT **** Black and White Mable Splatterware Medium-sized Tablespoon is 8" long and the bowl is 2" wide. ONLY 3 REMAINING. **** CLOSEOUT **** Black and White Marble Splatterware Small Spoon is 6" long and the bowl is 1.5" wide. ONLY 4 REMAINING. **** CLOSEOUT **** Navy and Cream Marble Splatterware Small Spoon is 6" long and the bowl is 1.5" wide. ONLY 4 REMAINING. 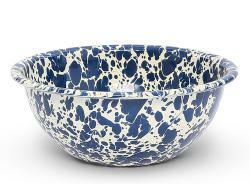 **** CLOSEOUT **** Navy and Cream Marble Splatterware Bowl. This 20 ounce capacity bowl is 6.25" in diameter and 2.25" deep. ONLY 2 REMAINING. 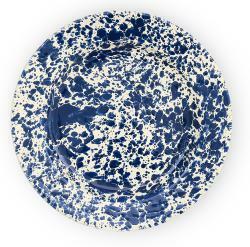 **** CLOSEOUT **** Navy and Cream Marble Splatterware raised rim Stew Plate is perfect for salads, stews and chilies. This plate is 8" in diameter and 1.4" deep. ONLY 1 REMAINING. **** CLOSEOUT **** Black and White Marble Splatterware Mess Plate is 9" in diameter and 1.25" deep with a 36 ounce capacity. ONLY 4 REMAINING. 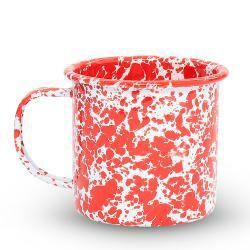 **** CLOSEOUT **** Red and White Marble Splatterware 12 ounce Mug is 3.6" in diameter and 3.15" high. ONLY 3 REMAINING. **** CLOSEOUT **** Red and White Mable Splatterware Dinner Plate is 10.25" in diameter and 1" deep. ONLY 4 REMAINING. 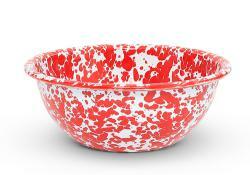 **** CLOSEOUT **** Red and White Marble Splatterware Bowl. This 20 ounce capacity bowl is 6.25" in diameter and 2.25" deep. ONLY 4 REMAINING. 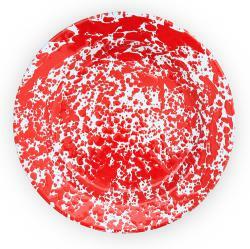 **** CLOSEOUT **** Red and White Marble Splatterware raised rim Stew Plate is perfect for salads, stews and chilies. This plate is 8" in diameter and 1.4" deep. ONLY 4 REMAINING. **** CLOSEOUT **** Classic pure white 24 ounce Mug rimmed with Blue is 4.3" in diameter and 4" high. 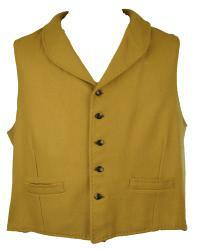 SALE Limited to stock on hand - this item has been discontinued by the manufacturer. ***** CLOSEOUT ***** Classic pure white 12 ounce mug rimmed with color. This mug is 3.6" in diameter and 3.15" high. Available in blue or black rim. Limited to stock on hand. 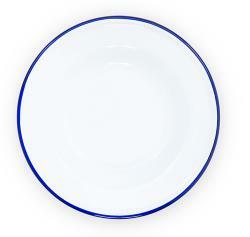 *** CLOSEOUT *** Classic pure white enamelware dinner plate rimmed with color. This plate is 10.25" in diameter and 1" deep. Available in blue or black rim. Limited to stock on hand. 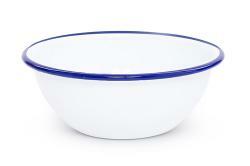 *** CLOSEOUT *** Classic pure white Enamelware Bowl rimmed with color. This 20 ounce capacity bowl is 6.25" in diameter and 2.25" deep. 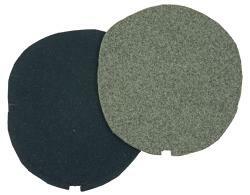 Available in blue or black rim. Limited to stock on hand. *** CLOSEOUT *** Classic pure white enamelware raised rim Stew Plate rimmed in color is perfect for salads, stews and chilies. This plate is 8" in diameter and 1.4" deep. Available in blue or black rim. Limited to stock on hand. *** CLOSEOUT *** Splatterware 12 ounce mug. This mug is 3.6" in diameter and 3.15" high. 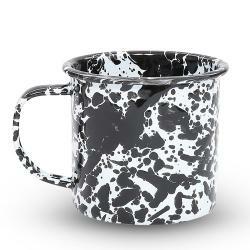 Available in Black/White or Blue/White marble splatterware. Limited to stock on hand. *** CLOSEOUT *** Blue and White Marble Splatterware dinner plate is 10.25" in diameter and 1" deep. ONLY 4 remaining. *** CLOSEOUT *** Splatterware Bowl. This 20 ounce capacity bowl is 6.25" in diameter and 2.25" deep. Available in Black/White or Blue/White marble splatterware. Limited to stock on hand. *** CLOSEOUT *** Splatterware raised rim Stew Plate is perfect for salads, stews and chilies. This plate is 8" in diameter and 1.4" deep. Available in Black/White or Blue/White marble splatterware. Limited to stock on hand. 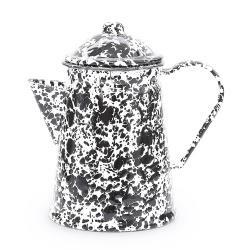 **** CLOSEOUT **** Black and White Marble Splatterware 1.5 quart Coffee Pot is 7.8" high x 5" in diameter. This item has been discontinued by the manufacturer. ONLY 1 REMAINING. Set of early 1900's fraternal International Order of Odd Fellows buttons, Shoulder Boards, embroidered Insignia, and Pins. 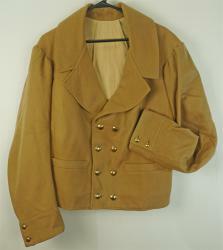 8 large coat buttons, 4 smaller cuff buttons, set of shoulder boards with attachments, pair of collar insignia, pair of sleeve badges, and 2 pins. 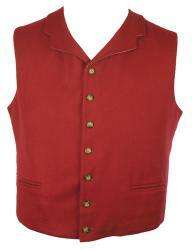 This set was purchased separately but it did come off the Antique Frock Coat - Size 34. 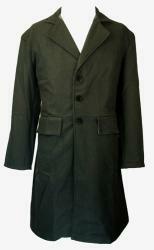 The coat is available for an additional $75.00. 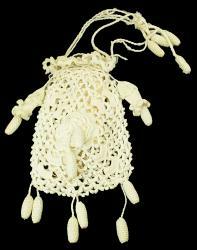 This macrame lace purse is suspected to be from the late 1800's Victorian era when macrame lace was most popular. The rectangular purse is delicately 'square-knoted' in an ecru yarn. The purse is embellished with pink and aqua ribbon bows and is lined. As this is an antique purse there are some small condition issues. 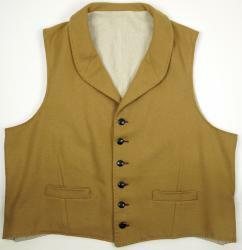 The lining is worn and can easily be replaced. The ribbon bows are a bit weary and can easily be replaced. There is no evident soiling. This purse is a beautiful display piece and could easily be gently used as well. The purse measures about 12" high x 7" in wide. The delicate handle is about 8" long. 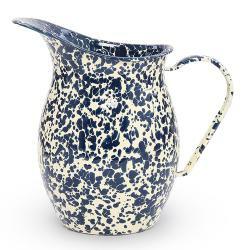 CLOSEOUT*** Splatterware 3 quart pitcher available in Navy/Cream marble splatterware. This pitcher is 6.5" in diameter and 9" high. ONLY 1 REMAINING. CLOSEOUT***** Splatterware frying pan. This pan is 9.75" in diameter and 1.5" deep. The handle is 7.5" long. 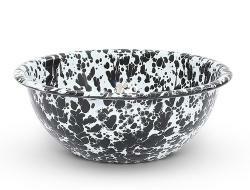 Available in Black/White marble splatterware. ONLY 2 REMAINING. This late 1800's crocheted ladies purse features crocheted acorns and flowers and flower, acorn tassels. The purse has a drawstring closure and is lined. As this is an antique purse there are some small condition issues. These issues can easily be fixed. 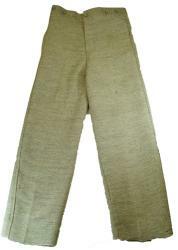 The lining is worn and can easily be replaced. The strap is fraying, but can also be easily replaced. The purse has a bit of dust and very, very light soiling. This purse is a beautiful display piece and could easily be made serviceable again. The purse measures about 10" high x 6 1/2" in wide. The delicate strap is about 7" long. 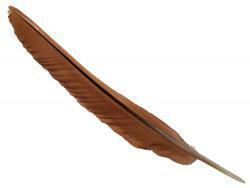 This item is offered on a first come, first served basis. This item is sold "as is" and all sales are final. 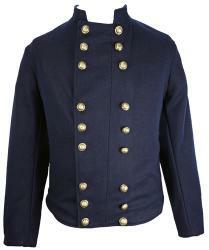 NEW, never worn C&C Sutlery CS officer's Double Breasted Shell Jacket SIZE 38 Short made of BUTTERNUT wool with Solid INFANTRY NAVY BLUE Branch of Service trim on the Collar and Cuff and Navy Blue Lapel Piping Trim. 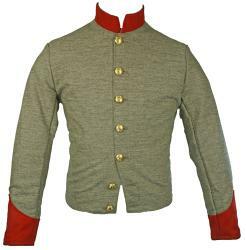 This jacket is a 24 button front with CSA buttons, has a function cuff with 3 buttons, is lined with a MAROON HOMESPUN lining, and has 2 inside pockets. 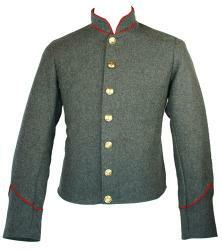 NEW, NEVER WORN C&C Sutlery CS Shell Jacket SIZE 40 in GREY JEAN WOOL, Artillery Red Collar and Cuff with Block "A" buttons. 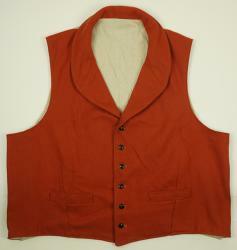 7-Button Front. Only 1 Available. SOLD AS IS. All sales FINAL. 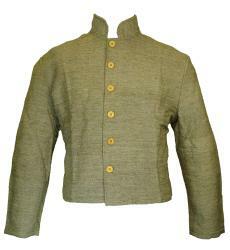 The jacket is lined with a Muslin lining and has one inside pocket.